The last year has been a tumultuous one for TaylorMade Golf. Gone are the days of a midnight driver launch, where golfers lined up to grab the latest and greatest from the company that was billed as the number one driver in golf. Back in May, the company was sold by adidas to KPS Capital Partners and the next several months were filled with a lot of changes internally. One constant for the team has been their evolution the last few years in the driver game. Back in 2016, the company released the M1 and M2 drivers that featured a new look crown and gained instant popularity. This past year, they repeated the name with some tech advances in the 2017 M1 and M2 metal woods. Kicking off 2018, there is a new name and two new models to choose from. 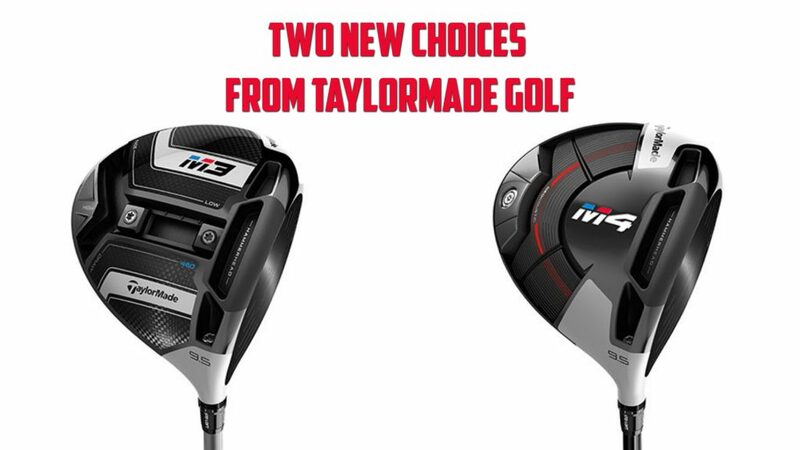 Introducing the M3 and M4 from TaylorMade Golf. You might notice a similar name and color scheme to that of the automaker BMW, but make no mistake about it, this is not a small evolution in technology from their previous lineup. The early pictures of both drivers have been circulating the internet for a while now, but none of those ever do justice to the actual products (regardless of brand). The departure here is enormous compared to every TaylorMade release as of late. The early talk will be centered around something the company calls Twist Face. What is it? In simple terms, the face is twisted to produce more forgiveness. Diving in a little deeper, the face of metal woods is not a flat surface. There is a slight curve to them and from heel to toe that is called bulge and from top to bottom that is called roll. Bulge is there to compensate for spin and roll is there to compensate for loft and both together add a level of forgiveness to the face of a product when you miss the sweet spot. 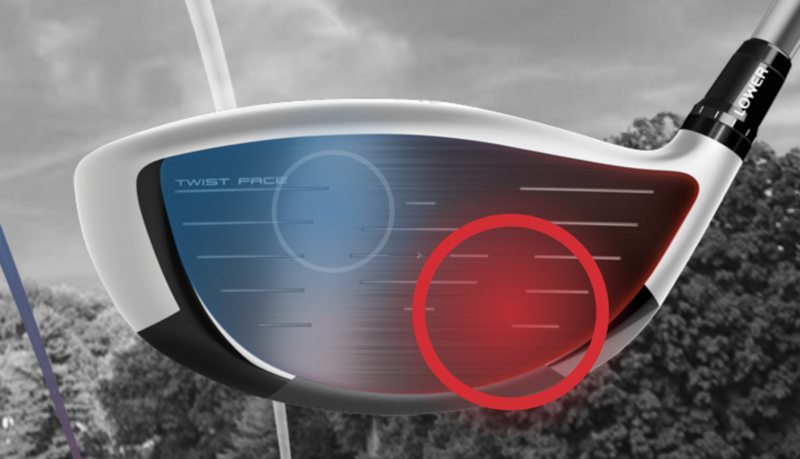 Twist Face (interesting choice of names, but it is catchy) changes that with an actual twisting of the face insert, which during TaylorMade’s internal testing, produced a straighter ball flight on off center hits than their previous products with bulge and roll. While the above will be one of the biggest tech stories of the new launch, it is not alone as the company is introducing something they call Hammerhead technology in both of these products as well. Slots are not new to TaylorMade drivers, and by design they are there to create a more flexible face, which in theory should increase ball speed across all areas to promote more forgiveness. As much as we like the name Twist Face for the catchiness, Hammerhead heads the opposite direction, but I digress. 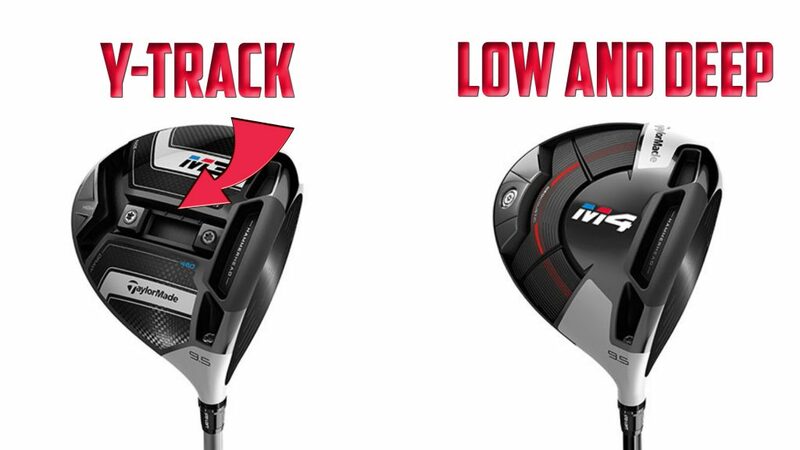 M3 and M4 drivers have the outer portions of the slots reinforced, which TaylorMade says allows for a lighter and more flexible face to increase ballspeed even further than previous designs, especially when the center is missed. Combined, here are two areas that definitely are in tune to promote an “accuracy story”. The accuracy or forgiveness story has been attempted in the past, but has never reached a level of success in the driver market, because as the old story goes, “Chicks Golfers dig the long ball”. This feels like something different though, because TaylorMade is not shying away with a distance story to go along with it. 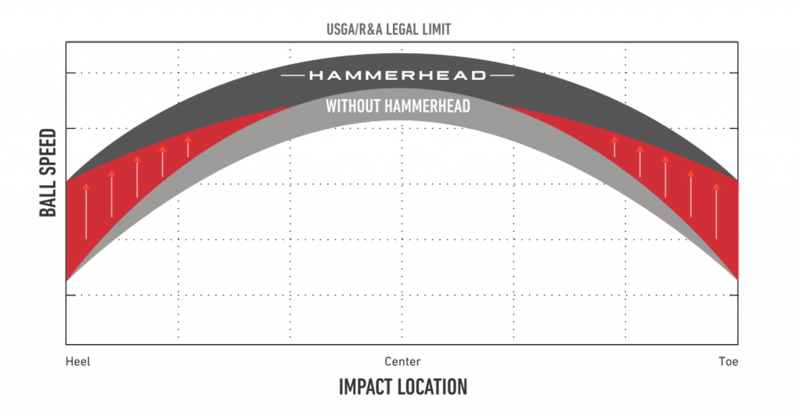 Hammering home Hammerhead (pun intended) as a ball speed technology, while talking about straighter drives than in the past might just be something golfers are ready to hear. The two models feature similar tech discussed above, but differ from there. The M3 has what they call a Y-Track on the sole. Two weights that move independently along a track that, you guessed it, is shaped like a Y. You can bring down the flight by moving one or both of them forward or bring it up by moving them back and then further tweak the flight by dropping one or both of them left or right of center depending on your desired ball flight or correction. It is important to note that moving these weights will alter the MOI of the driver in the M3. A driver packed with forgiveness, we were a little surprised there was no option for straight back, almost like a tripod rather than a Y, but TaylorMade answered that question with the M4. They remove the Y track and have single weight, low and deep, which takes that MOI number and pushes it up. The M3 features a standard shaft of the Mitsubishi Chemical TENSEI White, Blue or Red, dependent on weight you are looking for ranging from 70-50. The M4 has the Fujikura Atmos Red 6 in X flex and Atmos Red 5 in S, R and A flexes. The company is launching with a number of premium no-upcharge shafts as well, including a new UST ProForce V2 that should get THP readers pretty excited as it has yet to be seen before and we will have more coming on that one very soon. The M3 comes in right at $499 and the M4 drops that price by $100 and will hit stores at $399. TaylorMade needs a winner here and they have two models that are telling a story that, in some ways, has not been told in the past. Sure we have all heard of the forgiveness model and have seen some incredible gains in that area over the last five years from a number of different companies. With that said, when looking at their own releases, going all of the way back 10 years or so, the story has always been distance. Multiple ways to get there including long and light, being fast, aerodynamic, moving center of gravity and the list goes on, but we have not seen them depart to a lead story of accuracy before. If done well, without the sacrifice of the distance message, this could be a great rebound for a brand that was using the phrase number one driver in golf just a year ago. Now it’s time to sound off. Does this message resonate with you? Drop a comment below or in the THP Forum and let us know your thoughts on the new drivers. Thanks JB, nice break down. Looks to be a lot of innovation, my intriguement needle is pegged! The Twist face thing kind of throws me off a little, it makes it sound like the head will twist at impact or something which is kind of weird. Great article and a lot packed into it. TM has been off my radar for a bunch of reasons, but this lineup is intriguing. The tech story is interesting and one that at the very minimum deserves a look for any golfer looking for a new driver in 2018. My first concern will be the sound and how the acoustics come into play at impact. I’m curious also to see the full lineup of shafts available. Twist face and hammerhead are interesting names, but the forgiveness story will hopefully translate to sales for them. It’s good too see TM continue to innovate despite the internal corporate changes. The tech in these is very intriguing, I look forward to hearing more and seeing how the story translates to real world results. A lot to digest in the article. The Twist Face technology sounds interesting. Sounds like TM is aiming to target golfer that crave both distance and forgiveness with the technology packed into these two models. Curious to see what these are all about. If they can keep up with my Epic and offer more forgiveness it would be a coo. There’s enough here that I’m certainly going to test it and see if it can outperform my 2017 M1. Who doesn’t want a straighter ball flight? Thanks for the info Josh! !Not sure if the message gets me excited or not. Kind of feel like the hyperbole Taylormade gives off is an old story and really new but I will wait and see. Hope the drivers are a success for TM. I am liking what I am reading and excited to give it a swing. Great stuff JB. This is definitely an intriguing release and I’m glad to see TM coming out with interesting tech. It will be fun to see how this performs against the current #1 driver in the market. We will see how it fares for a company that was heading in the wrong direction. Do we know which one Tiger is going to be gaming? If any? As of right now we do not. Great explanation as always. Big difference in messaging as you go back a few years on their drivers. I expected 17 yards more. This might be the driver that kicks out my supertri. Only driver I have ever hit further was the Epic. Tried the g400 and it was shorter too. I am kind of happy they have stepped back slightly from the “tuned performance” idea and are going more with a straight-ball initiative. I am looking to replace my old driver this season. One of these may be in the running. Always happy to see new releases….no matter who they are from. I like the color scheme matching the BMW logo, seems a few OEMs went with some car influence this year. The Y weight track is interesting as well as the twist face technology. I’m curious how this compares to the cobra driver with similar tech.